When it comes to weddings, let’s be honest, the focus is usually on the bride. So, this week I want to change it up a bit and give a little shout out to the boys! 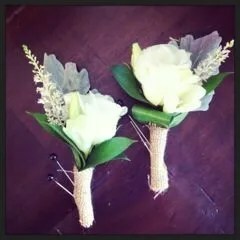 For the boutonnières for the groom, groomsmen and ring bearer, we like them to match the bouquets that we create for the bride and bridesmaids. We like to use small flowers that create an interesting splash against the suit or tuxedo. 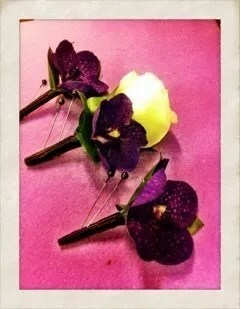 We also like to make the groom’s boutonnière a tad more special, since of course, it’s his day too! 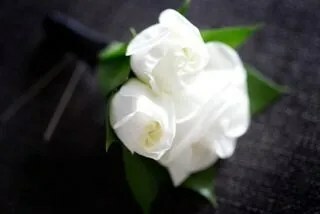 For example: if the bride is going with a classic bouquet of white roses, stephanotis with a pearl pin and white calla lilies, then we would suggest the groom have something from the brides bouquet to match. 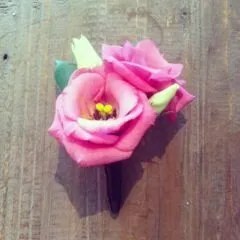 Perhaps a simple calla lily or rose with a special accent of the stephanotis with a pearl pin. 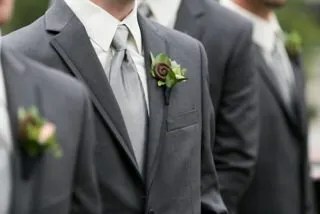 And, if the bridesmaids are going with white roses and white calla lilies, then the groomsmen would be either one of those. Of course, we can’t forget the ring bearer. Depending on his age, his would be mini to match! Here are some of our favourite designs from past grooms. So, when it comes to choosing flowers for the guys, you don’t always have to go traditional. Its fun to think outside the box. 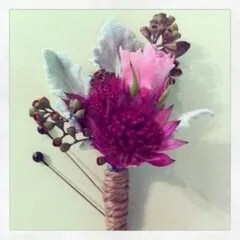 Now tell me, what’s the most out there boutonnière you’ve ever seen?